Lauren Graham in "Because I Said So"
Since the turn of the century, millions of faithful viewers have known her has Lorelai Gilmore, but well before that, Lauren Graham had carved out a niche as one of Hollywood's go-to "hey, I know her from somewhere" actresses. Even if you've never watched a single episode of "Gilmore Girls," chances are you've seen Graham in one of her appearances on "Caroline in the City," "Law & Order," "NewsRadio," or "Seinfeld" -- or on the big screen, in movies such as "Bad Santa," "Sweet November," or, um, "The Pacifier." Now that "Gilmore Girls" appears to be nearing the end of its first-run life, Graham is increasing her film activity; in 2007, she'll appear in at least two high-profile movies, including the Diane Keaton-led romantic comedy "Because I Said So" and "Evan Almighty," in which she'll play the wife of Steve Carrell's modern-day Noah. Things are definitely looking up for the actress who starred in not one, not two, but three failed pilots in 1996 -- even if "Gilmore Girls" goes the way of the dodo soon, expect to see a lot more of Lauren Graham at a theater near you. A comprehensive list of Lauren Graham's film and television credits. 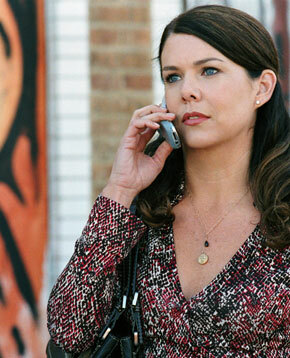 Everything you ever wanted to know about Lauren Graham, but were afraid to ask. "I kept playing the bland friend, and my line was like 'Let's go get a sandwich!'" "These days I'm extra nice in stores. It never fails that, whenever I look as bad as I can possibly look or I am sort of cranky because the store is out of something, that is precisely the time when someone one will recognize me and say: 'I really like your show!'"